In 2009 the Palestinian Authority has initiated an unprecedented campaign of historical revision and anti-Israel libels concerning Jerusalem, the focal point being the erasure and denial of 3,000 years of Jewish history in Jerusalem. In addition, the PA disseminates the libel that Israel is acting both to expel Arabs from Jerusalem and to destroy the Al-Aqsa Mosque. The Jerusalem libels are designed to evoke religious hatred by portraying Israel and the Jews as a threat to Arabs and Islam. This section documents the recent intensification of the Palestinian Authority's campaign of distortion, historical revision and hate incitement surrounding Jerusalem. 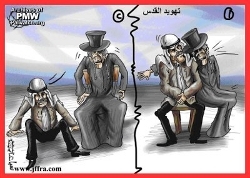 This cartoon with the caption "Judaization of Jerusalem" shows, from right to left, a sinister-looking Jew first sharing the chair with an Arab and then shoving him off. Since Jews are said to have no connection to Jerusalem, nor any right to live in the city, any Israeli action in Jerusalem is defined as "Judaization" and an attempt to erase the city's supposedly authentic Islamic Arab character. 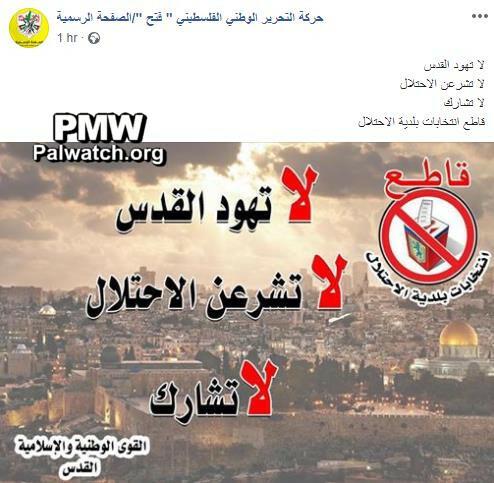 The PA has launched an incendiary libel campaign which presents as fact the lie that Israel is acting to destroy the Al-Aqsa Mosque and to expel Arabs from the city. 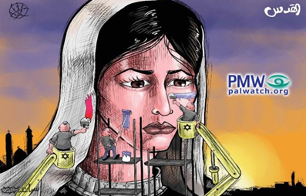 The goal of this PA alarmist campaign is to promote fear and hatred of Jews and Israelis. Calls to boycott Rami Levy supermarket in Jerusalem features cart full of skulls: "Do not be the occupation`s partner in the Judaization of the city; Economic normalization is treason"
The screenshot shows the opening of a Rami Levy shopping complex in the Atarot industrial area near Jerusalem. 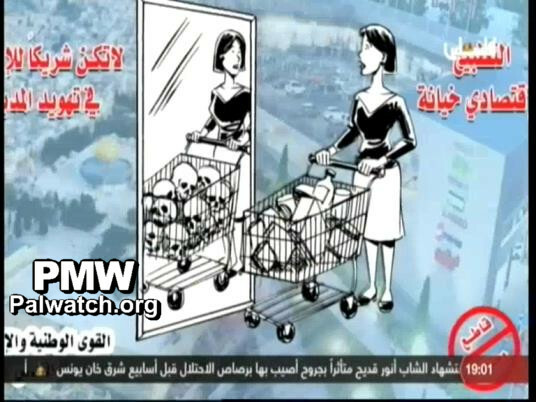 Text on bottom right: "On lands of the [Palestinian] residents of Beit Hanina, Israeli businessman Rami Levy opened a large shopping complex"
The screenshot shows a woman with a shopping cart with various items. In the reflection in the mirror next to her, her cart is full of skulls. Text on upper left side: "Do not be the occupation's partner in the Judaization of the city." Text on upper right side: "Economic normalization is treason." Headline: "The break-in to a [Jerusalem] district building –message understood"
"'Message understood. We will not heed it and will not abandon the members of our people in occupied Jerusalem, and we will continue to act for them' – this was the position of senior officials from Jerusalem in response to the break-in by occupation forces into a Jerusalem district building… District Governor of Jerusalem Adnan Ghaith said to WAFA: 'The message that the occupation wanted to convey to us is that we will not operate in Jerusalem, but Jerusalem will remain the place to which our faces are lifted. What occurred was an attack with American backing against the institutions, against our people, and against everything Palestinian.' … Fatah Movement Secretary in Jerusalem Shadi Mattour said: 'We will continue to pursue those who illegally transfer property in Jerusalem to the occupation. These steps by the occupation will not prevent the members of our people from excommunicating them and stopping them in order to protect the property in Jerusalem from Judaization.' … Mattour explained: 'Even if they target the offices and institutions, we will work from the street in order to serve the members of our people in Jerusalem.'" Fatah calls on Palestinians to boycott Jerusalem municipal elections: "Don’t Judaize Jerusalem, Don’t give the occupation legitimacy"
“The [PA] Ministry of Education and Higher Education… held the regular meeting yesterday [Sept. 26, 2018] with the donors and international partners, in order to increase the cooperation and help the education sector. Saidam sent two messages, the first to the donors, in which he emphasized that education is Palestine’s future… and the second to the education community: ‘Continue recording achievements despite the obstacles that the occupation is placing, and continue to work with team spirit.’"
Headline: "Al-Habbash gave a letter from President Abbas to the Ivory Coast president"
"Supreme Shari’ah Judge of Palestine, [PA] President [Mahmoud Abbas’] advisor on Religious and Islamic Affairs, [and Chairman of the Supreme Council for Shari'ah Justice] Mahmoud Al-Habbash… gave the Friday sermon yesterday [Sept. 7, 2018] at the great Plateau Mosque in Abidjan, Ivory Coast… Al-Habbash emphasized the need for the unity of the nation and Muslims throughout the world around the cause of Jerusalem and the blessed Al-Aqsa Mosque, as it is the central cause of the Muslims, and also emphasized the need to stop the ongoing crime against the Al-Aqsa Mosque, which is bowing under the yoke of the occupation and is being subjected to criminal attempts to divide, destroy, and Judaize it." PA government: Light Festival in Jerusalem is "Judaization;" Jerusalem has been Arab "since the dawn of history"
"The [PA] national unity government yesterday [July 1, 2018] condemned the Judaizing festival called the International Festival of Light, which the occupation authorities are holding in occupied Jerusalem. Official [PA] Government Spokesman Yusuf Al-Mahmoud said: 'What the occupation authorities call the International Festival of Light in our occupied capital is nothing but one of the means of Judaization, which the occupation authorities are attempting to impose.' He added: 'The reality requires that the festival be called the Blackout Festival and not the Festival of Light as they call it, as the occupation is attempting to use all means for its dark goals, and this includes the light and its beauty, in order to guarantee that an additional blackout will be imposed on the history and present of the most holy and ancient Arab city…' Al-Mahmoud said that the entire world agrees that East Jerusalem is an occupied Palestinian city, and more than 138 states recognize it as the capital of the State of Palestine. He added that most of the historians, Arabs and foreigners, and among them Israelis too, recognize the Arabness of Jerusalem since the dawn of history (sic., the first Arab conquest of Jerusalem was in 638 CE)."